The made-in-the-USA brass and stainless steel Spurcycle bell is available in raw metal or black and will set you back $49 (click to enlarge). If you ride busy trails, having a bell on your bars is all but a must. Far better to warn unsuspecting hikers or slower riders of your approach with a subtle “ding” than to yell, whistle, or just buzz past. 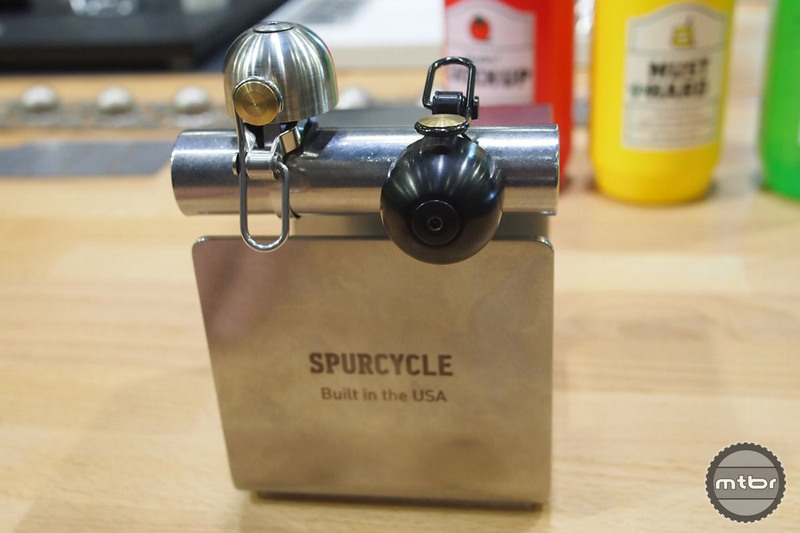 One of our favorite noise makers is the Spurcycle bell, which was also among the most popular booths at this year’s North American Handmade Bike Show in Sacramento, California. 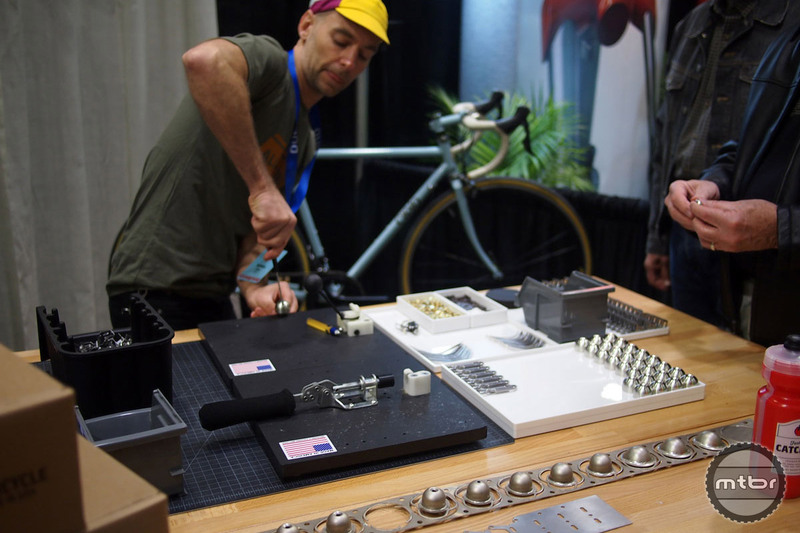 That was no surprise, considering that in a convention center full of hand crafted bike aficionados, Spurcycle was hand assembling these elegant bells right there on the show floor. The company was started by a pair of San Francisco engineers who wanted to create a better bell. The result is both great looking and easy on the ears. Have a listen for yourself. The made-in-the-USA brass and stainless steel Spurcycle bell is available in raw metal or black and will set you back $49. It comes with a lifetime warrantee and is claimed to ring three times longer than other bells. It fits bars with diameters from 22.2mm to 31.8mm. 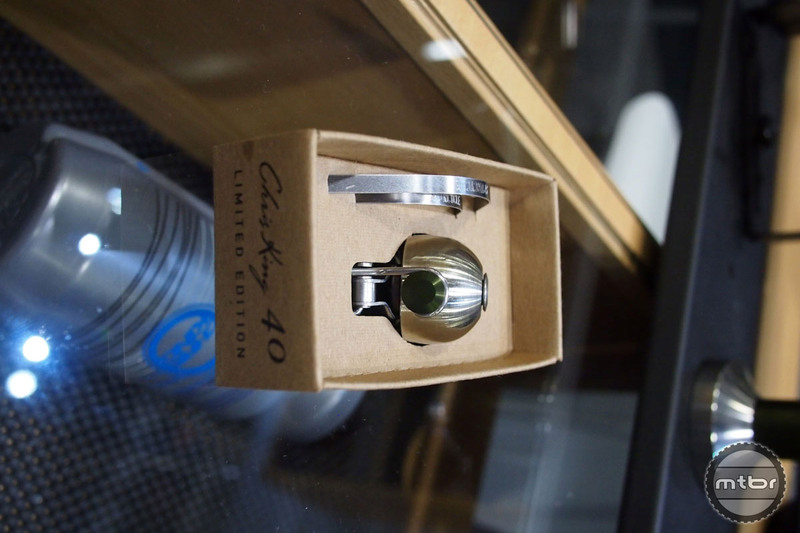 Chris King commissioned Spurcycle to produce bells (in anniversary King color) for the Special Edition Chris King 40th Anniversary collection. The made-in-the-USA brass and stainless steel Spurcycle bell is available in raw metal or black and will set you back $49. Spurcycle was hand assembling these elegant bells on the show floor at NAHBS. Great bells. I’ve got two from their first shipment. The black one seems to be lasting forever. The shiny one (brushed? anodized?) seems to be corroding a little bit internally, resulting in less volume. From the get-go I have thought the Spurcycle bells overpriced for what you get. Even a hand painted Japanese Crane bell is less than this thing. It does not really sound all that different than a lot of other bells that can be purchased for 1/5 the price. Interesting design but it brings nothing new to bicycle bells. Not long ago I posted in the NorCal forum that I had stumbled upon a Chinese made copy of the Spurcycle bell. Now normally I do not like to see cheap copies of intellectual property made in China, but this time I actually am pretty enthusiastic that the copy is going to take market share away from Spurcycle. I mean, originally posting in your Kickstarter that the bells were going to go for an overpriced $35 then when you hit production you raise the price to $50? Really, even for a Rapha-afficionado-level-item that is stupid ridiculous, so a very close copy sold from China at $9 plus shipping? I must say I enjoy the fact Spurcycle has a been ripped-off. Even the box the bell comes in is similar to the Spurcycle bell. Hahahahahahahahahaha! I bought one last year and love it. If you just want a bell, then spend $10 and get one. The Spurcycle is small, minimalist, good looking, great sounding and yes, expensive. $50 is a ton for a bell, but I like it and am happy to support a company that produces domestically. Great gift idea for the rider(s) in your life.